Graff-Pinkert & Co. is a family-owned, 75-year-old firm dedicated to selling great machine tools to the turned parts industry. Graff-Pinkert is an international leader in selling used automatic multi-spindle screw machines, including Wickman, Acme-Gridley, New Britain, Tornos, Davenport, Schutte, Gildemeister, Euroturn (ZPS) and INDEX. Graff-Pinkert also specializes in rotary transfer machines, Hydromats in particular. Graff-Pinkert also sells CNC Swiss machines, including Star, Citizen, Tornos DECO, and Hanwha. The company also sells a variety of other types of CNC machines from brands such as OKUMA, Haas, INDEX, Doosan, Mazak, Miyano, and Mori-Seiki. Graff-Pinkert's inventory is held at its 25,000 square foot Oak Forest (Chicago suburb) headquarters. Graff-Pinkert is the largest North American stocking dealer of Wickman screw machines, and new and used Wickman spare parts and attachments. Graff-Pinkert is capable of doing full rebuilds of Wickmans and sells refurbished ACME-GRIDLEYS among other screw machines. Graff-Pinkert is one of the few machinery dealers in the world that buys used Hydromat machines and Hydromat units for stock. By stocking the machines and units the company has the capability to turnkey Hydromats for customers' specific jobs. 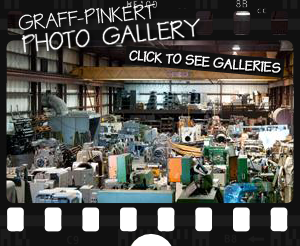 From large machines to small replacement parts, Graff-Pinkert has been doing business on eBay™ since 1999 and has a 100% positive feedback rating. Visit our eBay™ store. Recently Graff-Pinkert has started offerening a new service to companies in the machining industry, matching buyers and sellers of machining companies. With Graff-Pinkert's extensive contacts around the world in the machining industry and rich knowledge of the industry gleaned from 75 years in business it is in a unique position to help machining companies looking to grow as well as help machining company owners who want to retire or capitalize on their assets.